The plan, which was devised by Senate President John Cullerton and Senate Minority Leader Christine Radogno, is comprised of 13 interdependent bills. The Senate Executive Committee began hearings Tuesday on elements of a bold, bipartisan plan to break the state’s budget gridlock. The plan, which was devised by Senate President John Cullerton and Senate Minority Leader Christine Radogno, is comprised of a series of interdependent bills that outline tax hikes, a statewide minimum wage increase, reforms to the state’s workers’ compensation system, and a two-year property tax freeze, among other things. All 13 or so proposed bills must be passed for any of the bills to take effect. The Senate Executive Committee is expected to discuss a variety of those measures during Tuesday's meeting, but won't take action on elements of the package. Cullerton and Radogno were initially pushing for a Wednesday floor vote on the deal, but have since backed off that aggressive timeline. On Tuesday, Radogno claimed the Senate plan is currently the best option to end the state's lingering budget impasse. “This is a huge package with many, many moving parts and I can’t stress enough how much we are interested in constructive feedback to make this thing work,” she added. If the complex package can clear the Senate, it will still require approval from the Democrat-controlled House and Republican Gov. Bruce Rauner. Last week, Rauner lauded Cullerton and Radogno’s bipartisan push to craft a budget deal, but wouldn’t explicitly back their developing plan. If the package fails, the state’s ongoing budget impasse will likely continue to fester. Under the Senate proposal, the state’s income tax would reportedly jump from 3.75 percent to 4.99 percent. The corporate tax rate would also jump from 5.25 percent to 7 percent. Additionally, the plan outlines a state minimum wage increase from $8.25 to $11 an hour. The so-called “grand bargain” would also include a two-year property tax freeze, as well as pension and workers' compensation reforms. Illinois' most recent stopgap funding plan expired at the start of the year, leaving the state’s higher education and health and human services in a precarious position. 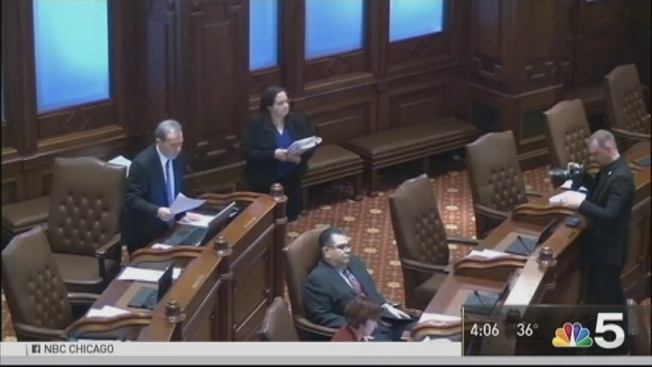 The Senate committee approved a bill Tuesday that amends the Chicago Municipal and Chicago Laborers articles of the Illinois Pension Code to aid the fund's solvency. The measure was previously passed on the final day of the last General Assembly and is currently awaiting approval from Gov. Bruce Rauner.